I'm a sucker for a little patterned cardigan and this animal print from Joe Fresh is my favourite. 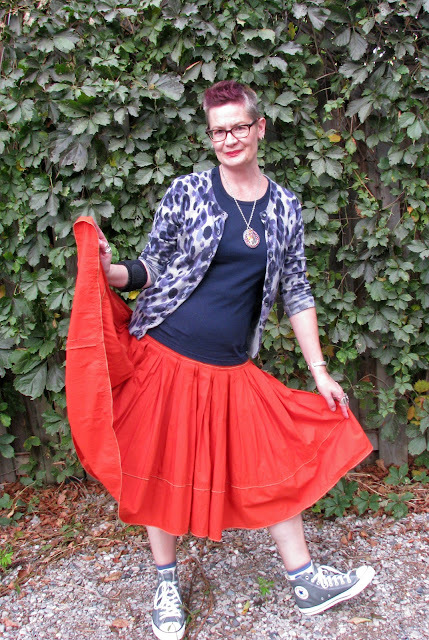 I found this skirt at a thrift store last weekend and it's bright orange-y fullness looked nice with the blue (opposites on the colour wheel - I haven't forgotten everything I learned in school! ), and I felt a little bit like an extra from a 50's musical, minus the saddle shoes. My grey converse have become my shoes of choice these days, as to my dismay, I've developed a severe pain in the metatarsal of my right foot, which is making walking uncomfortable, and impossible to wear any hard-soled shoes or heels of any height. Why does having "Foot Problems" suddenly make one feel so old? How about you, my fellow bloggers and readers - have you found that as you age, your feet are starting to betray you? Blue and orange is a favourite colour combination of mine too. Ah, foot problems... I'm still in denial so let's talk in a little while! Ah yes....Dansko is my footwear of choice! I do have to respect my feet more than I used to--I have to have a good fit and wear heels very sparingly. I have two pair of tennies that I wear a LOT. I love full skirts. Yeaaaaaaaaah,one of my fave colour combinations!!! I am very cruel to my feet, and I KNOW I shall pay the price, but it doesn't stop me!!! I'm already suffering a little, and indeedy, foot problems make me feel old...........I just have another drinkie to dull the pain!!! Glorious colour combo! You are a vision! Great skirt and cardigan Shelley! Gone are the days when I could dance all night in stilettos (sigh!). I have plantar fasciitis now and can only wear shoes with orthotics. Bummer. Yep! got my problems too! but i try to work around them! Something bad happened something good too happens, the good thing about your foot is that you get to wear those fabulous Converse and it suits you so well! Great retro vibe - especially love your skirt - and your poses today are perfect. Sorry to hear of your foot pain! This is where my 15-year stint in combat boots / Docs is paying off some - I still have a sense of my feet as finite, but haven't totally used them up. I wear orthotics in any shoe / boot which will accommodate them, and limit the frequency / duration I wear outrageous heels. Of course, my unwittingly good health decision of that era is well-balanced by plenty of really bad health practices of the same period! Shelley, the skirt is such a great and brilliant color and the animal print cardigan is the perfect partner for its flair. I admire your photography and your poses! I'm hoping that your metatarsal pain improves soon; any reduction in mobility is so difficult and frustrating. probably has something to do with where i work (children's shoe store) but: i truly believe being fit in quality footwear from the get-go (babies first steps!) helps later-in-life when it comes to foot problems. it's too late for me! all the best in your recovery. 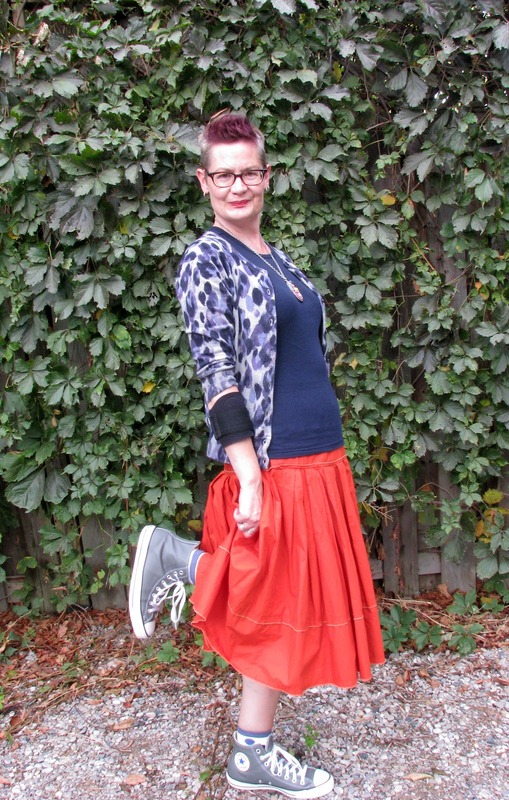 I like the combo of the full skirt and the converse shoes. Yes, my feet have let me down, not so much pain and discomfort but rather just unloved, dry and suffering from excess chlorine and swimming. The feet let me down a long time ago... a bummer. I have pain on very cheap of my feet, particularly after I walk on tile floors. however carrying soft slippers helps quite an bit. i believe it is a neuropathic downside, and definitley pestering. As for my hands, they generally get pins and needles-mostly whereas lying down, or sleeping.